Imagine providing the children’s hospital in your city with the largest, fastest, and most capable helicopters for transporting critically ill patients — and at no cost to the hospital or the patient’s family. 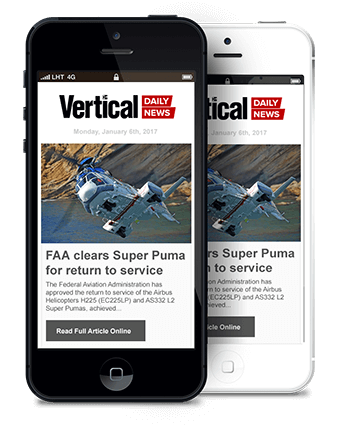 That’s what Los Angeles-based Helinet Aviation has done for over two decades. 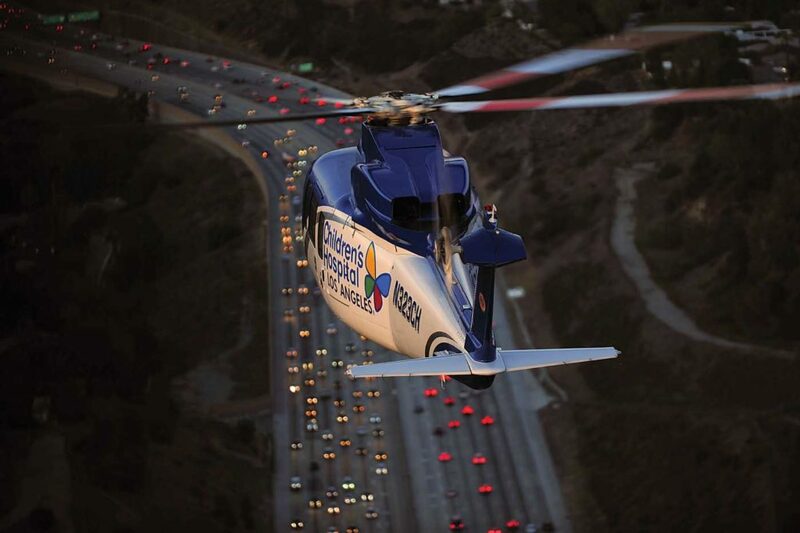 Since 1999, Helinet has served the Southern California region as the sole helicopter air ambulance provider for Children’s Hospital Los Angeles (CHLA). 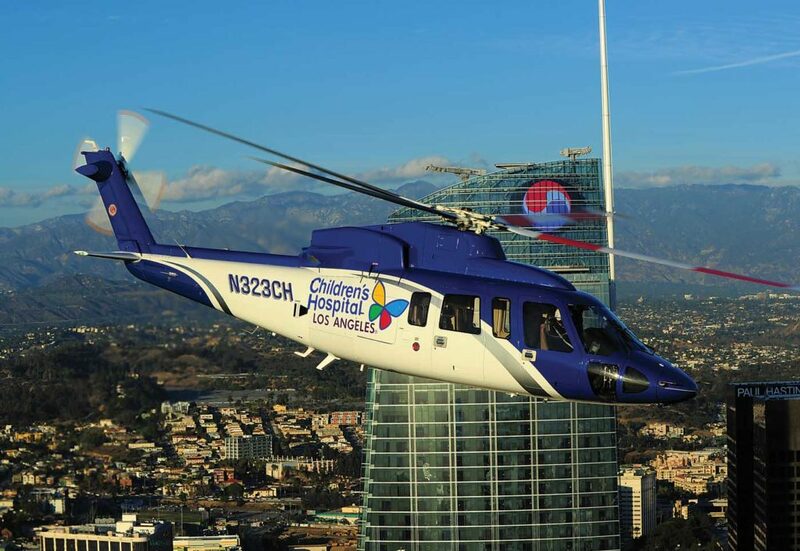 The program operates 24 hours a day, seven days a week, 365 days a year, using two specially equipped helicopters to transport infants, children, and teenagers from outlying medical facilities to CHLA for the highest quality pediatric care in the region. 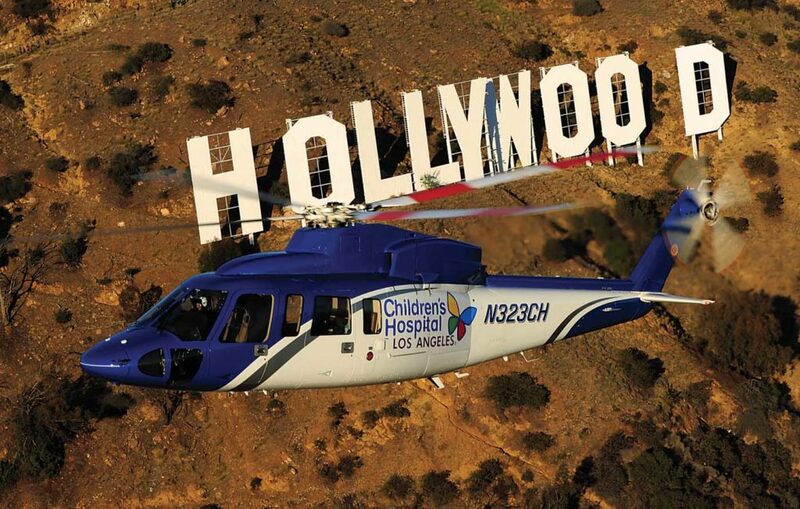 The CHLA helicopter emergency transport program started in 1999 with Helinet’s donation of a Sikorsky S-76A; it added a second, more powerful and capable aircraft, an S-76B, in 2011. Recently, the long-serving A model has been retired and replaced with a more advanced S-76C+, which like the B model is a 155-knot machine with the performance needed to operate at high altitudes on hot summer days. 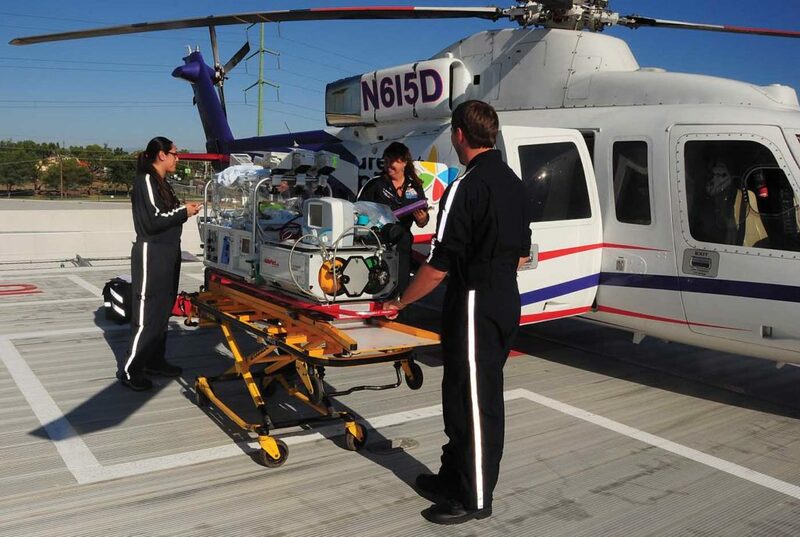 The program averages more than 475 patient transports every year, with Helinet continuing to provide the helicopters, pilots, insurance, and aircraft maintenance all at no cost to the hospital. The Helinet/CHLA partnership began when CHLA’s manager of emergency services, Judy Sherif, approached Helinet founder Alan Purwin. Sherif explained that the nonprofit hospital — which draws patients from across Southern California and beyond — was interested in starting a regional helicopter transport program but was simply unable to shoulder the financial commitment necessary to develop and maintain such a service. Purwin agreed to fund the program and provide the helicopter. Helinet would bill patients’ insurance providers when it could, but otherwise, it would cover the operating costs itself. Although it was a huge commitment, Purwin and his wife, Kathryn, felt it was worth the investment to provide this valuable service to their community. Kathryn Purwin assumed the chief executive role at Helinet after Alan died as a passenger in a plane crash in Colombia in 2015. The hospital renamed the program the Alan Purwin Emergency Transport Program shortly after. Now, 20 years after the program started, her commitment to it is unwavering. The very first helicopter used for the CHLA program was an AgustaWestland (now Leonardo) A109C, but this quickly proved to be undersized for the specialized medical equipment and crews required for these flights. So, Helinet replaced that aircraft with the S-76A, which had a more spacious cabin to accommodate the program’s needs. Pilots liked the speed and reliability of the Sikorsky product, although they found it underpowered for some of the hospitals they were sent to. With calls coming from all over Southern California — and sometimes as far away as San Francisco or Las Vegas — the program’s operating area encompasses many hot and high landing zones (LZs). The A model would do the job, but without much performance margin. 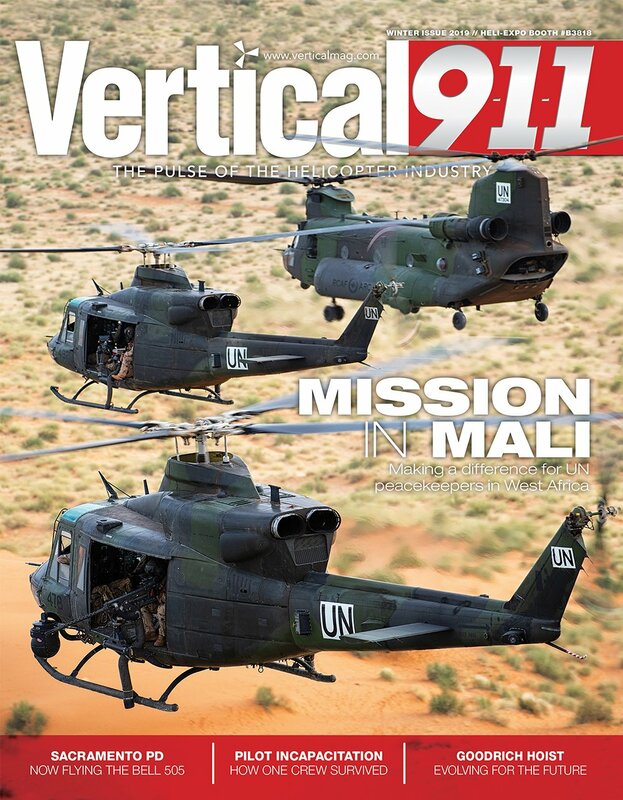 In 2011, Helinet decided to procure the much more powerful S-76B to serve as the program’s primary helicopter. Equipped with two Pratt & Whitney Canada PT6B engines, the 11,700-pound (5,300-kilogram) gross weight B model has a higher rate of fuel burn and less endurance than the S-76A. 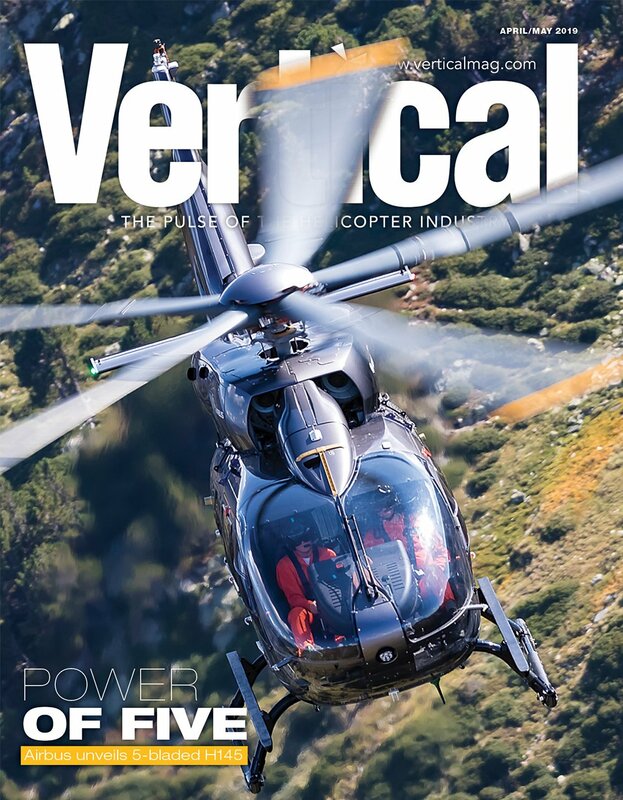 However, it was a trade-off that Helinet was willing to make for the power to more safely venture into the mountains and desert, even on hot days. More recently, Helinet decided to upgrade again, to a much newer S-76C+. Fitted with two Safran Helicopter Engines Arriel 2S1 turbines, the aircraft has the same 11,700-lb. gross weight as the B model, with both the power and the endurance the program requires. It is also equipped with a modern, state-of-the-art medical interior by Spectrum Aeromed, and a Stryker stretcher that allows for patient transfer from a local airport or LZ if the referring hospital doesn’t have a helipad. 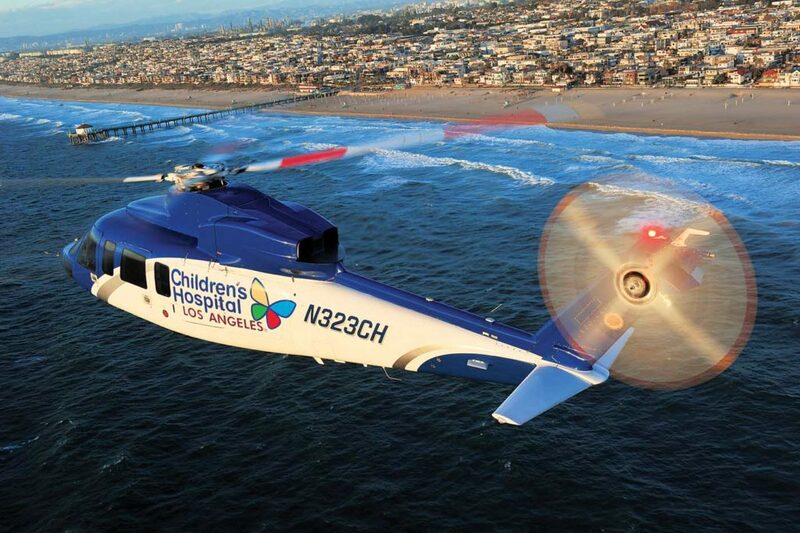 The CHLA helicopters are based at Helinet’s headquarters at the Van Nuys Airport, and are also serviced there. Helinet understands that transporting children is a massive responsibility, so maintaining the aircraft to the highest standards is a top priority. All inspections are done in-house, and factory-trained mechanics are available on call seven days a week, ensuring that the aircraft can be attended to immediately if an issue arises. 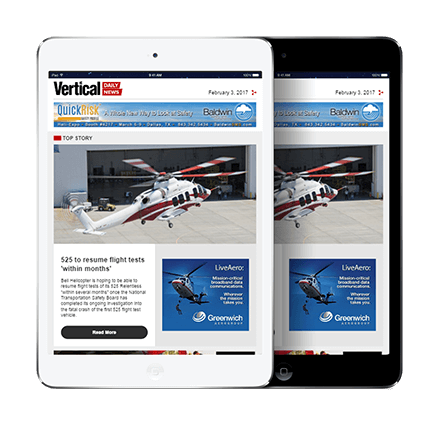 Although Helinet tries to keep both aircraft available as much as possible, having a back-up machine allows the program to maintain coverage even when one S-76 is down for heavy maintenance. Planning maintenance for the aircraft can be a challenge, but it is a juggling act that Helinet is well adapted to. Helinet operates the CHLA aircraft with four dedicated S-76 pilots (two additional pilots are available as back-ups). Each pilot undergoes annual recurrent training in full flight simulators at CAE’s training center in Morristown, New Jersey. The pilots work 12-hour shifts, from 7 a.m. to 7 p.m., with handovers occurring before the start of each shift. Each pilot starts their shift with a thorough aircraft pre-flight inspection and weather briefing. Then, the pilot will do a call-in briefing with the CHLA Access Center and Transport Team to discuss staffing, weather, temporary flight restrictions, and any operating limitations such as a closed hospital pad that might delay a transport. When a flight request comes in from CHLA, the pilot is not given any information on the patient’s age or condition. The goal is to remove emotions from the pilot’s flight planning and “go/no-go” decision-making process, making for a safer flight for everyone. 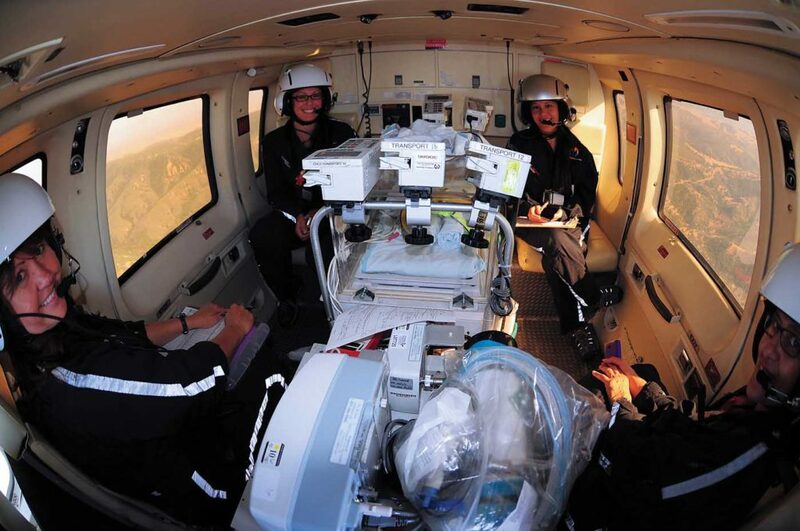 The Alan Purwin Emergency Transport Program does not perform scene calls; instead, it transports patients only from smaller or less specialized facilities that lack the expertise to treat very sick babies and children. CHLA provides the medical team for each flight, drawing on a core group of physicians, registered nurses (RNs) and registered respiratory therapists (RRTs) with specialized training in neonatal, pediatric, and cardiothoracic intensive care. These clinicians are based at CHLA, approximately a 15-minute response time from the airport. After they have alerted the pilot of a flight, completed their preflight responsibilities, and assembled the medical equipment needed for the transport, they head up to the helipad where the helicopter awaits their arrival. On each flight, the configuration of the medical team is tailored to the patient, which can range from a premature infant to a teenager with trauma head wounds. One flight might carry an RN, RRT, and a physician; another might have an RN and RRT with a supporting emergency medical technician (EMT). Specific medical equipment also varies by patient — for example, the smallest patients may need an incubator capable of warming or cooling the newborn, specialized ventilation, and delivery of specialized inhaled gases, among other features. In addition to their medical training, all of the clinicians involved with the program are trained on helicopter operations and helicopter safety. Crew resource management (CRM) receives special emphasis, and all team members are encouraged to speak up about any concern that might have a bearing on the safety of flight. It was pleasure training your S-76A/B model crews when I was an S-76 Pilot Instructor with FlightSafety, in West Palm Beach, Florida. You should be proud of your Program. I am now retired and living in the Vero Beach, FL area.